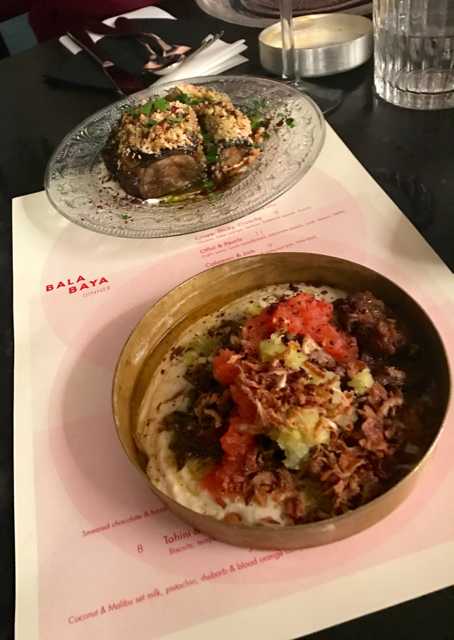 Earlier this year the all day dining restaurant Bala Baya (@balabayauk), opened reflecting London’s continued growing interest and love of Middle Eastern food. There were lots of articles in the press and on social media but what really intrigued me was the Owner/ Executive Chef Eran Tibi and his quest to make the type of pitta bread and street food he grew up with in cosmopolitan Tel Aviv. 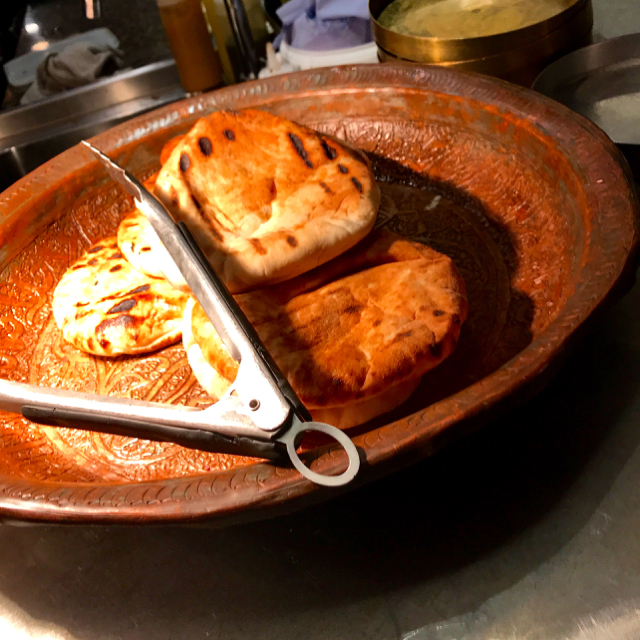 Eran, a protégé of Yotam Ottolenghi could not find the right kind so decided to set up a production line at the back of his restaurant in Southwark to produce a flavoursome pitta bread pocket – charred on the outside and fluffy on the inside. 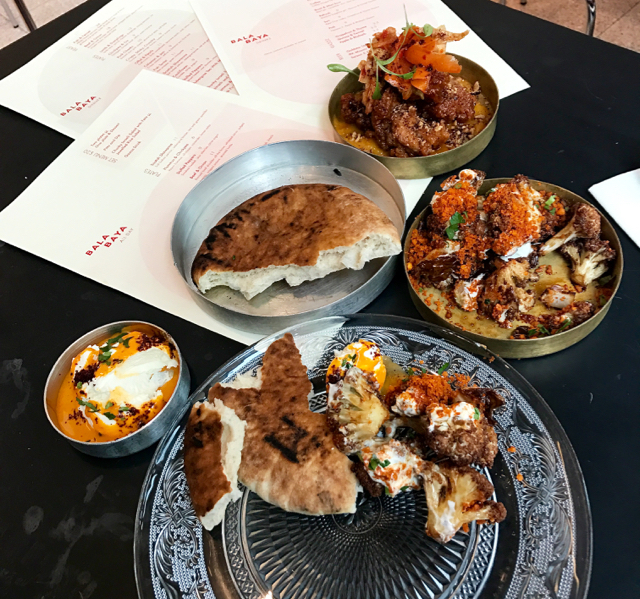 Pitta is the perfect partner with the sharing plate dishes on the menu, however if you are not into bread there is plenty to eat and enjoy. I decided to go for a late lunch and meet and chat with Eran, Tomr (General Manager), Charlie ( Head Chef) and Chronis (Head of front of house). I chose the cauliflower, char-roasted and topped with a tasty crumble and cool yoghurt giving bursts of flavour- a delicious version of the popular cauliflower schwarma, eaten elsewhere. The other dish, was called ‘Crispy, Sticky, Crunchy’ and was a fusion of Korean fried chicken with some Middle Eastern twists. Lots of layers of tastes and textures, a small plate that packed a big punch. The crispy coated chicken was complimented with bitter orange, harissa, kimchi, and a smooth butternut squash purée. This dish reflects Eran’s eclectic tastes that really worked well. I also had the pitta and dip – a fab combo of charred flavoursome bread with a cooling, seasoned yoghurt dip. To drink I chose a non-alcoholic Gazoz, having not heard of these drinks, whose origins are in Turkey, and are popular in Israel. I chose the grapefruit & thyme version – a refreshing thirst quencher – slightly carbonated – very fruity & slightly sour. Although pretty full, for research purposes I wanted to try the desserts on the lunch menu – Burnt Babka & Malabi. 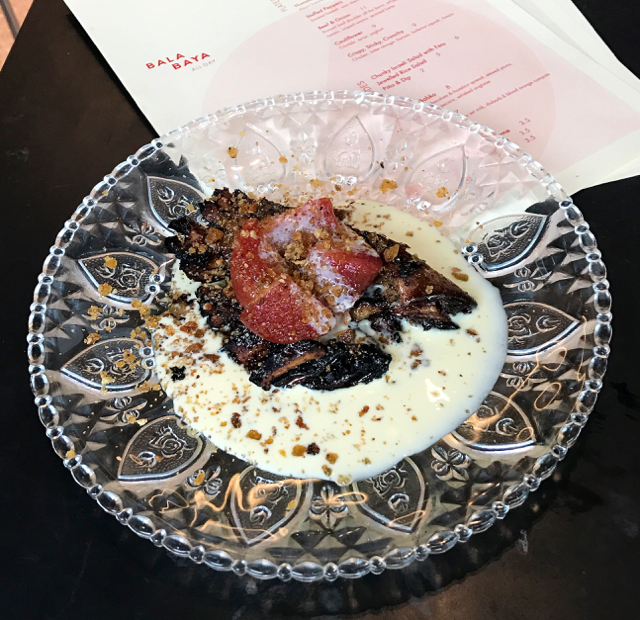 The babka was a slice of the yeasted classic with chocolate & hazelnut, but charred to bring out a different flavour and served with stewed plums, caramelised pecans & whisked anglaise custard. 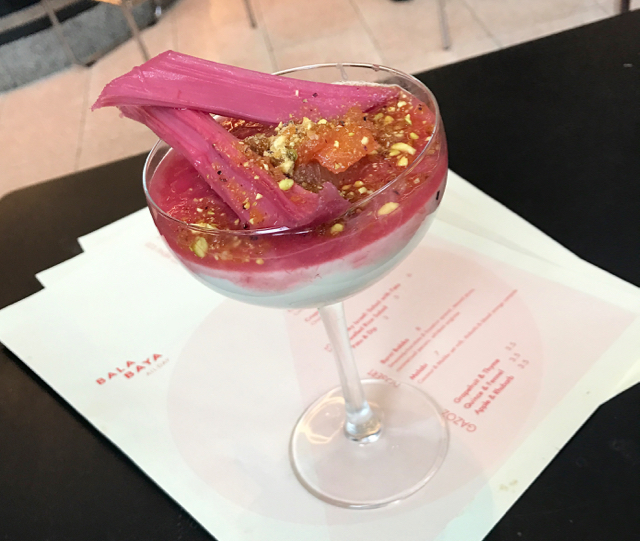 Surprisingly for someone that is not keen on Malibu, my favourite was the Malabi – a coconut milk & Malibu set milk custard served with a rhubarb and orange compote. A great flavour combo and lighter way to finish lunch. I was keen to experience the more extensive dinner menu, so went back a few weeks later with Carolyn, Laure & Tracey – 3 foodie friends. 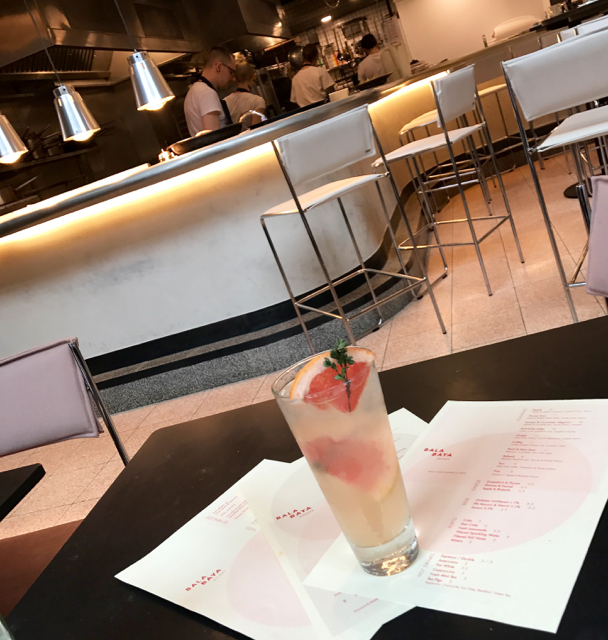 I am a big fan of mixing and matching and casual dining – and Bala Baya really delivered. We decided to pick a dish each rather than opt for the tasting menu. Tomr was keen I try the new dish ‘Spring Salmon’ -cured spiced fish with rhubarb, preserved lemon & dill jellies. This dish was a subtle combo & a good way to get the tastebuds ready for more full-on flavoured dishes to follow. We tried the ‘Lamb & Dumplings’ (slow cooked lambneck, quince, Persian dumplings, young Pecorino & jus); ‘Calamari & Jam’ (crispy calamari with saffron and butternut jam & lime aioli); Cauliflower ( same as lunch dish), and ‘Stuffed Peppers'( spiced freekah, sour cherries & citrus yoghurt). 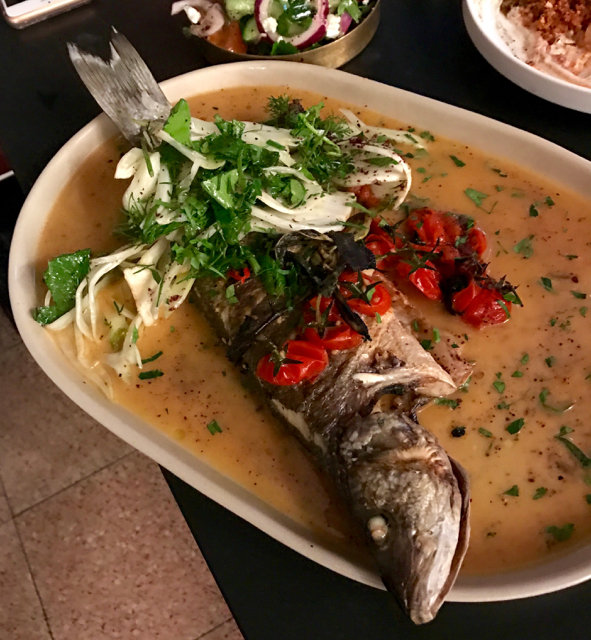 Our 3 favourite dishes were the ‘Fish & Fennel’ – a whole cooked sea bass with fennel, burnt sage and lemon, griddled vine tomato with a butter and anise sauce. The fish was soft and succulent and an expert mix of flavours. We also loved the ‘Chickpea & Ox’ with slow braised oxtail, tahini & warm hummus – bold flavours and very tasty. The 3rd dish simply described as ‘Aubergine Tea with Milk’ was an intriguing description so we had to try it. We were not disappointed by the understated titled dish that was a beautiful combination of tea- smoked soft aubergine with a delicious yoghurt topping. 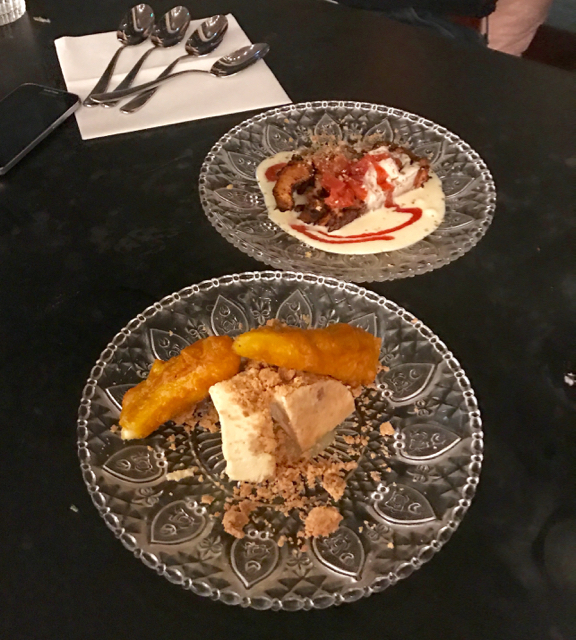 We had 2 desserts to share with 4 spoons and chose the burnt babka (same as lunch menu) and the tahini & banana cheesecake with crushed biscuits, tempura banana , salted caramel & praline. I am definitely more of a savoury person but we enjoyed having a little sweet treat to sign off our meal. 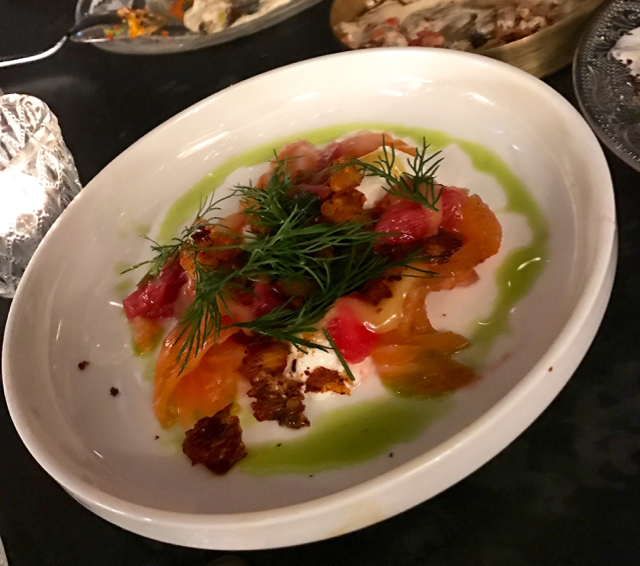 It was a fun Friday night to catch up with foodie friends, whilst enjoying the buzzy vibe and yummy food at Bala Baya under the railway arches in Southwark. Thanks to Eran, Tomr, Charlie and the crew for fantastic customer service. #balabaya, is an Israeli term used to express admiration for a woman’s strength and love. I certainly loved the strong flavoured delicious dishes and will be back for another visit soon. Bala Baya, Arch 25, Old Union Yard Arches, 229 Union Street, London SE1 0LR. (balabaya.co.uk). I just love middle eastern food!!!! It’s always so tasty and full of delicious flavors. Definitely going to visit it on my next trip to London. Thanks for sharing!! !